The battles being re-enacted during Civil War Weekend at Heritage Village Museum occurred during the Tullahoma Campaign between June 24th and July 3rd, 1863. The campaign is named for the city of Tullahoma, which is located in South Central Tennessee. This campaign is notable to Ohioans as over 36 Ohio units participated. The forces engaged in the Tullahoma Campaign were the Army of the Cumberland, commanded by Major General William S. Rosecrans for the Union and the Army of Tennessee, commanded by General Braxton Bragg for the Confederates. The Union sent Colonel John T. Wilder and his mounted infantry brigade through Hoover’s Gap, one of several lightly defended passes through the mountains. Wilder’s men had an advantage over the Confederates because they had the new Spencer Repeating Rifle, which greatly increased the rate of fire compared to the older guns. Wilder’s “Lightning Brigade”, as it became known, easily pushed out the rebel defenders. 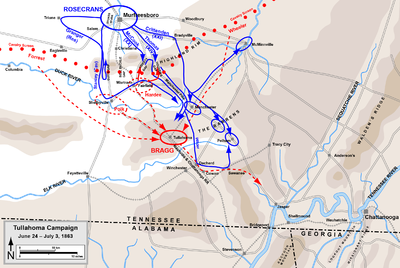 The battle of Hoover’s Gap, along with the movement of the Union’s main line, forced the Confederates to withdraw to Chattanooga. The battle of Hoover’s Gap during this campaign opened the door for the Union army to reach Chattanooga, which was a strategic objective of President Abraham Lincoln. Despite being a resounding Union Victory, the Tullahoma Campaign is often overlooked since the Battles of Vicksburg and Gettysburg also took place the same summer. Heritage Village’s Civil War Weekend is May 18th 10am-5pm and May 19th 10am-3pm. Re-enactment battles occur each day at 2pm.